Motocross GP champ Stefan Everts will make history by entering all three classes at the French GP in Ernee on September 13 and 14. The Belgian clinched the MXGP title at the last round at Loket, so has decided to become the first rider to enter the 125, 650 and MXGP classes all on the same day. The 30-year-old already has the most motocross world championships (seven), and the most race wins (69). He is also the only rider to win two GPs on the same day a feat he has managed seven times this season in the 125 and MXGP classes.
" 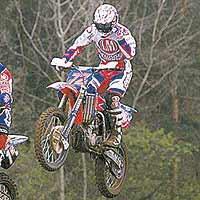 Ever since I won two races in a day people have been asking why I don’t try for three, " said Everts. " Now the title is won I have nothing to lose. Some people will expect me to win all three, but that’s probably asking too much. " This could the be last chance for any rider to achieve the feat as the series will switch to justtwo classes next year, with the 125cc race being renamed MX2. Everts could even leave France as an eight-times world champion. KTM’s Steve Ramon only needs an 18th place finish to clinch the 125cc title, but a failure to finish would leave the way open for Everts, or fellow Yamaha rider Andrea Bartolini. Do you think Stefan Everts can achieve three wins in a day? Post your predictions on the Motocross message board by following the link on the right.